While on vacation recently I read a book I enjoyed so much, I read it twice. That’s saying a lot for a girl who used to despise reading. The book is called Modern Rapunzel by Jeanne Powers. The cover looks a little bizarre and out of touch, but don’t let that fool you. It boasts a ton of information about women’s health and natural beauty, especially for hair and skin (my top two concerns when it comes to aging gracefully – fingers crossed as 30 approaches). 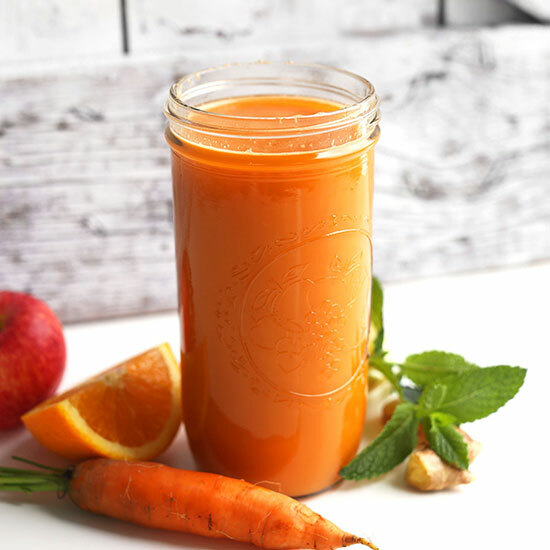 In the book, Jeanne shares about a time when she got very sick and suffered from hair loss as a result, and she nursed herself back to health with natural remedies, including carrot juice. This is my kind of lady. Carrots are loaded with beta carotene which does wonders for the body and fights off disease-causing free radicals. 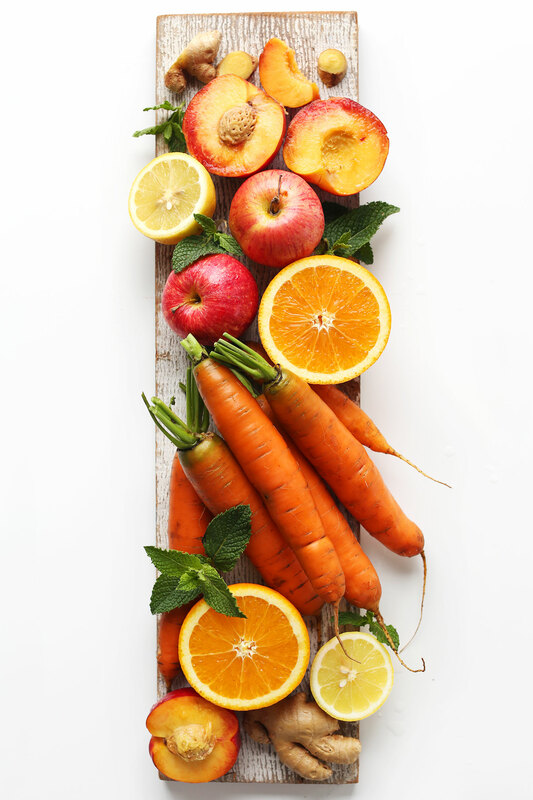 They’re also extremely high in Vitamins A, B, C, E and K, magnesium, potassium and calcium, and have been found to fight inflammation, relieve congestion, and protect eyesight and brain function among many other benefits. All of these vitamins and minerals boast a ton of benefits for your skin and hair. Naturally, they’re my new best friend. I’m not typically a big juice fan because I prefer smoothies and the fiber they provide. But, for carrots, I make exceptions. While I was reading this book, we were on vacation in Healdsburg, California, home to a beautiful restaurant called Shed. Their coffee shop offered two fresh daily juices: one green and one orange. The orange boasted carrots. I was in. I enjoyed an orange juice almost every day we were there, and I’ve since been making my own inspired version at home. Get ready for some good, healthy fun, kids. This 6-ingredient, 10-minute (juicer-free!) 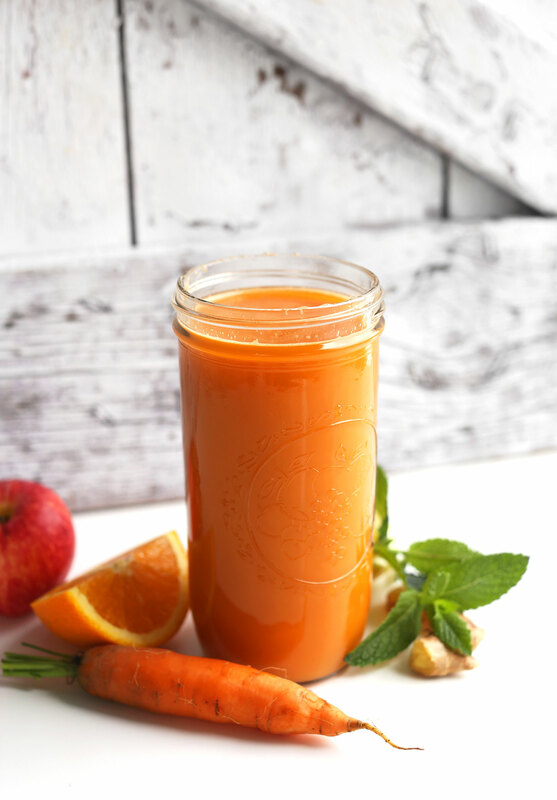 juice is based with carrots and naturally sweetened with orange, nectarine, and apple. Lemon juice adds brightness, and ginger some zing (and anti-inflammatory perks, yo). Mint is optional for an earthy, minty vibe. Do it – you know you want to. I hope you guys love this beauty elixir. It’s extremely simple, easy to make, loaded with vitamins and minerals, super delicious, and my new go-to morning beverage. If you give it a try, let us know what you think! Leave a comment, rate it, and don’t forget to tag a picture #minimalistbaker on Instagram! We’d love to see your juice in action. Cheers, friends! A vibrant orange juice made without a juicer! 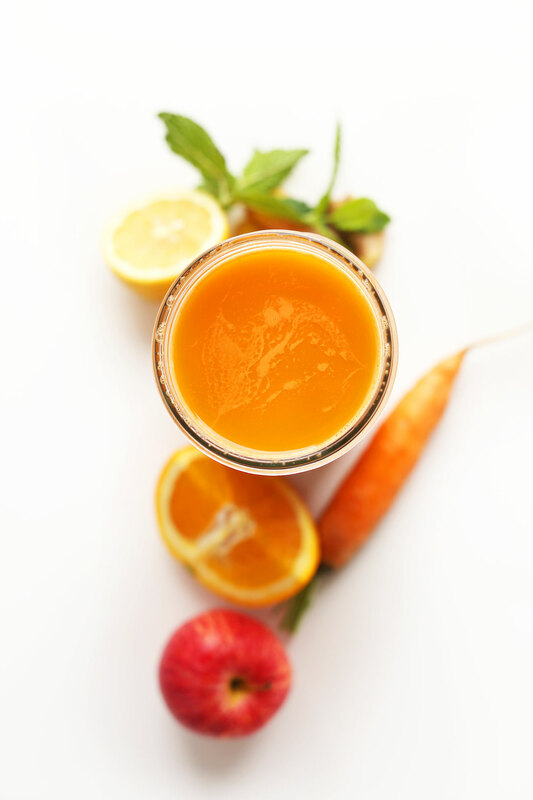 Vitamin C-rich carrots, oranges, lemon, ginger, apple and nectarines create this hydrating, refreshing juice packed with vitamins and minerals! 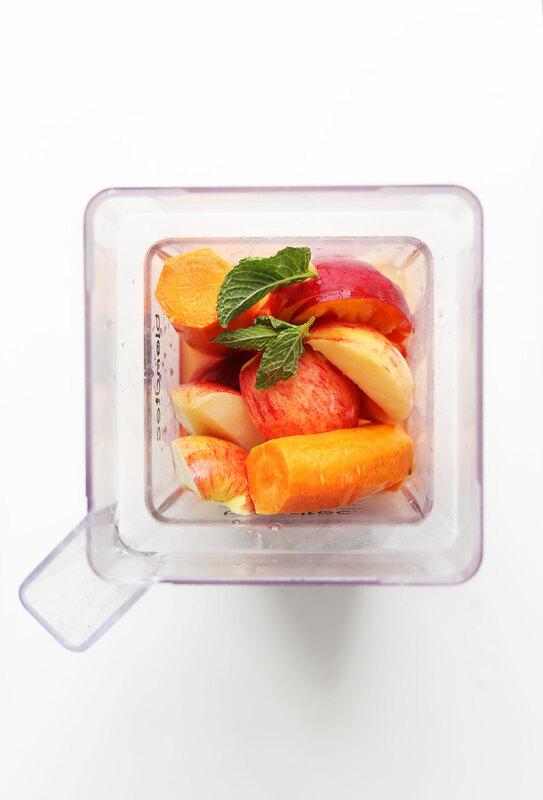 If using a juicer, add all ingredients to the juicer and press (omit water). Otherwise, squeeze orange and lemon juice into a blender as the pulp can make the juicing process more difficult. Next add nectarine, apple, ginger, carrots, and mint (optional). Top with filtered water (start with the lesser quantity), cover and blend until combined. You don't want your blender to get the juice too hot in temperature so be careful not to over-blend - it shouldn't take more than 30 seconds. 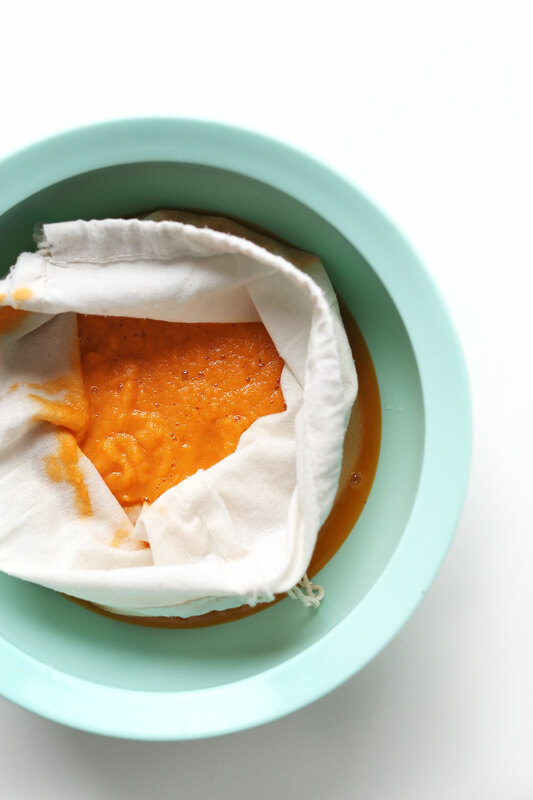 Drape a clean, thin towel over a large mixing bowl and carefully pour over the juice and pulp. Then gather the corners and begin extracting the juice, leaving the pulp behind. Continue squeezing until all juice is extracted. You can either compost the pulp or add it to baked goods! Enjoy the juice fresh. Cover and refrigerate leftovers for 2-3 days, though best in the first 12-24 hours for mineral and vitamin content. *Use organic fruits and vegetables whenever possible. *To reduce sugar content, leave out 1-2 of the fruits (such as nectarine and apple). *The recipe as written yields about 2 1/2 cups juice. *Recipe inspired by the Orange Juice at Shed. *If you're looking for a carrot smoothie, try my Ginger Carrot Turmeric Smoothie. Do you do anything/have any recipes with the carrot “pulp”? I love the carrot juice but feel wasteful throwing out all that perfectly good fiber. I’ve heard of other food bloggers that use that pulp in other recipes and was wondering if you had any similar recipes! You could try adding it to our carrot muffins, perhaps? Looking for your black bean falafel recipe to make for family tonight! The link is broken :) I wasn’t sure how to contact you and tell you! I have featured this Super Powered Orange juice recipe in our website Green Thickies post 10 Best Fruit Based Meals, because its a fantastic recipe. I haven’t posted the actual recipe, but only one image from here and a small quote and link back to the recipe page. All credits given to you. This juice seems like i great idea,I’m hoping to try it!! I already made it without water. Can you please let me know may I need to use water when I blend? If using a juicer do I still add the water? It is really nice to enjoy such juice. yummmy yummy. oh!!! Oh!!! i cant spend a day without it. Hello! I love the site and all of these yummy recipes! Would adding a bit of spinach and/or turmeric change anything about this recipe? Perhaps, but only a bit depending on how much you add. Good luck! I love the look of this recipe! I’m a huge fan of carrot juice too so the ingredients for this morning booster will definitely be on my shopping list for today. Daaaang what a clever juicing method! I got rid of mine because it was so bulky and such a bummer to clean. A huge fan of anything with carrot and ginger in it, especially because ginger is so cheap and accessible in China. Awesome share! I was just in Healdsburg for my birthday. It is literally my favorite place in the world. I need more juice in my life, I prefer smoothies over juices, as well, but sometimes it’s too much to make a smoothie. This looks like a fantastic recipe! Thank you! I wish I had carrots at home right now! Sounds and looks delicious. One word of caution though; back in the 70’s people started juicing and drinking carrot juice everyday. My friends dad literally turned carrot color! I kid you not, the man was orange all over his body! It took months of him not drinking carrot juice to return to his normal color (Italian tan). Maybe once a week or twice, but don’t drink it everyday. Ha! I make it occasionally but know that’s a potential side effect! “Modern Rapunzel “sounds like a great read. Speaking of Women’s health and natural beauty, I feel I need to share another website and author to look up. The site is called Floliving, it is an amazing site all about eating properly for your hormones and overall health. This woman, Alisa Vitti is revolutionary in helping women over come female issues such as infertility, fibroids, ovarian cysts etc. Her book “Woman Code” available on Amazon is a great read and will have some people looking at food in a whole new way. This information is not just if you are having issues but also helps you preserve your natural youth. Love your site and recipes. Thank you for sharing them. Already know it! Thanks for sharing! Love Alissa Vitti and the Woman Code! I Love love LOVE that you posted a juice recipe that is right up my alley!!!!! Thanks so much! I’ll be making this daily! Without a doubt! I’m 30! Don’t be scared! It’s so awesome!! Ha! Thanks Mandy. Hope you love this juice! What is the towel that you used called and where can I get one like that? It looks like you poured the juice into it like a bag? That looks much easier than methods I have tried! The one I used is just a fabric bag that came with a product I bought. But really any thin dish towel will do! Cheese cloth is what I use over a fine mesh strainer in case I squeeze too hard. I’m just taking a sip of this juice (okay, okay, I inhaled half the thing already, you caught me :)) and I love it! I would never have thought to blend and strain carrots to make juice, absolutely genius Dana! <3 I used pantyhose for a cheap strainer, worked perfectly! Hmmmm, I’m popping over to your place for a sip!!! Hehe. I’m a huge juice, just don’t like cleaning the machine. I knew how good carrots were for you, but I guess I didn’t realize just how good. WOn’t touch traditional store-bought orange juice with a 10 foot pole. No way. Don’t need the sugar. This looks great!